Travel planning is too damn hard! You buy the travel books, read the forums, put together a sweet itinerary and you still aren't sure. So you go to the forums and post your itinerary and kindly ask for reviews...crickets. Or trolls. Or maybe a nice comment or suggestion, if you wait long enough. And which forum was that? There are so many. Wouldn't it be great if there was one place you could post your itinerary for review and expect timely and useful ratings from people who had actually been there? That's what we aim to do with Itinerated. 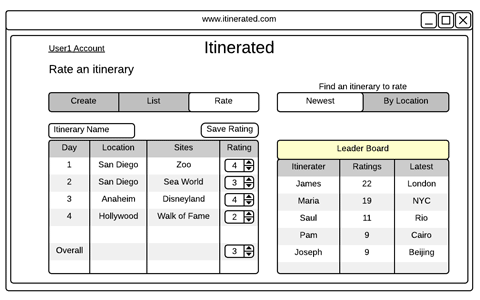 Itinerated will be a fun web application that lets you create an itinerary and get it rated by the crowd. You also get to rate other people's itineraries, which is a great way to discover new itineraries and unlock more features for your account, like immediate alerts when your itinerary gets a new rating. It's free for the basic features plus there are a couple of paid premium levels that have some great features for power travelers. You can help make this happen. Preorder a $25 basic paid plan and you get Itinerated for life (normally it's a one year subscription) or $50 for a lifetime subscription to the power traveler paid plan. 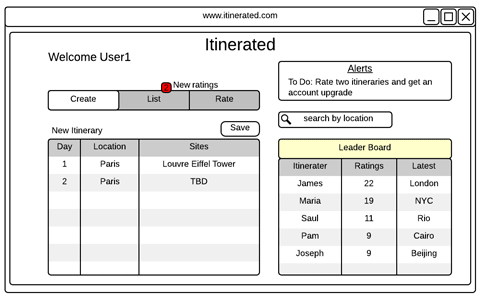 Itinerated lets users enter their itinerary and submit it to be rated by other users as well as rate others' itineraries. What product tiers does Itinerated have? Tier 1 Free allows users to enter two itineraries for review, view ratings of their itineraries, view all users' itineraries and ratings. Tier 2 Free allows users with a confirmed email address to receive once daily alerts of any new ratings of their itineraries. Tier 3 Free allows users who have rated at least two other users' itineraries to do one-click copy of others' itineraries to their own account. Tier 4 Paid allows user to receive immediate email alerts when a new rating is received. Itinerated was created by Mark George, a technologist who has worked in a variety of fields, including microcircuit design, website development, and foreign language translation. He has traveled and lived abroad for many years and has grown weary of struggles he and others experience when planning trips and seeking input on itineraries. This work is licensed under the CC By-SA 3.0 without all the other cruft that would otherwise be put at the bottom of the page.